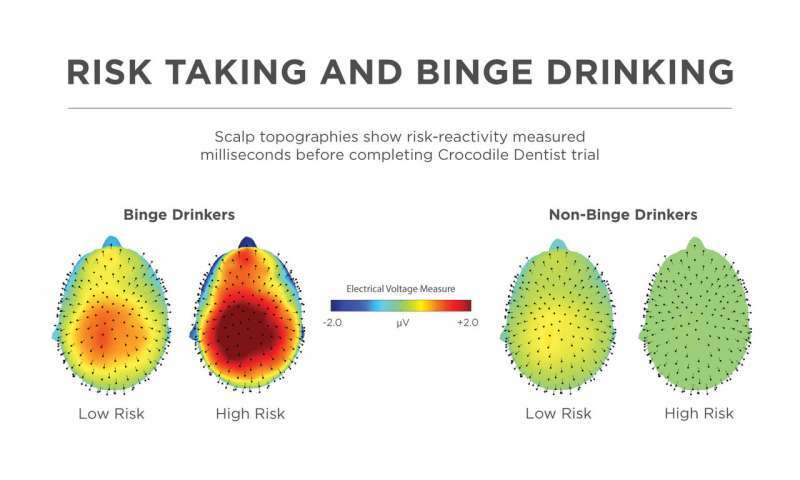 New Husker research suggests the same people who get a stronger jolt playing Crocodile Dentist may chase a more dangerous buzz when drinking, thanks to an anticipatory spike in their brains. University of Nebraska-Lincoln doctoral student John Kiat combined a simple child's game with high-tech brain measurements in a novel experiment examining how the brain's risk reactivity is connected to risky behaviors like binge drinking. The results showed the brains of self-reported binge drinkers react to perceived risk much more prominently than non-binge drinkers. 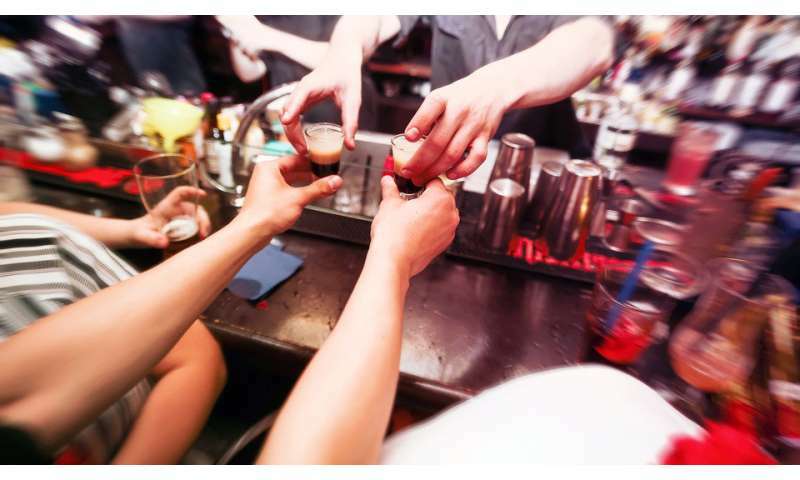 "What we found was that non-binge drinkers exhibited significantly reduced reactivity during risk anticipation," Kiat, a doctoral candidate in psychology, said. "Binge drinkers showed a much stronger 'spike' in activity while they were playing the game that non-binge drinkers didn't demonstrate." "It seems likely that binge drinkers get a similar stronger response while drinking." Twenty-six people were tested for the study, which included playing a version of the game and answering questions about alcohol usage over the past 30 days. Binge drinking was defined as five or more drinks within a few hours. While undergoing EEG testing, they were instructed to press each crocodile tooth in a sequential order. The game provides a healthy dose of risk through pressing teeth down until the pressing the wrong tooth makes croc's jaw snap shut on a player's finger. The EEG imaging found evidence of elevated neural reactivity among binge drinkers as the likelihood of getting chomped on increased, while the response of non-binge drinkers remained largely unchanged. The findings are one of the first examples to show an association between risk reactivity and binge drinking frequency. Kiat noted the study is also novel in that the risk-taking activity did not include a decision-making component, since participants were told to press the Crocodile Dentist teeth down in a certain order, instead of randomly. 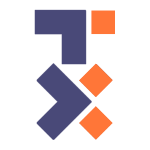 "Prior research hasn't looked at raw reactivity, without a decision-making process," Kiat said. "We know that high-risk taking populations exhibit elevated risk reactivity during decision-making, but would that elevation still be there even if no decision is involved?" "Our study suggests that the story might actually be quite simple, that even if you take away the decision element, you still get that escalation of reactivity in binge drinkers, and possibly in others who choose high-risk activities." Kiat said the findings could be expanded in a larger study and help further explain the brain's role in choosing hazardous behaviors. "Looking at individual differences in neural responses helps us understand the influence of the brain on good and bad decision making," Kiat said. "We can then build an understanding of how differences in neural processing drive risk-taking, and how targeted interventions can be developed to reduce high-risk health behaviors." The study, which is co-authored by sociologist Jacob Cheadle, was published online and is forthcoming in Social Cognitive and Affective Neuroscience.